Just to post up an update on three points regarding the oppression remedy under section 181 of the Companies Act 1965. (i) Damages is a remedy available in oppression, or is it? I am guided by Weng’s post entitled ‘Damages for Oppression: an Illusory Remedy?‘ where he referred to the Federal Court decision in Koh Jui Hiong @ Koa Jui Heong & 8 Others v Ki Tak Sang (Rayuan Sivil No. 02-83-11/2012(M), 29 October 2013). This appeal originated from the High Court decision in Koh Jui Hiong @ Koa Jui Heong & Ors v Ki Tak Sang @ Kee Tak Sang & Ors  8 MLJ 818. The question of law in the Federal Court decision was “whether an award of damages can be made in a petition under section 181(1) of the Companies Act 1965.” The section 181 action in this case had been filed by a director of the company (the 1st Petitioner) (I will elaborate more on this in the section below), some of the minority shareholders (the 2nd-8th Petitioners) as well as the company itself (the 9th Petitioner) in an action against the 74% majority shareholder (the Respondent). The Federal Court appeal only dealt with the issue of how the Court of Appeal had upheld the High Court decision to order the Respondent to pay damages to the company, the 9th Petitioner. I would highly recommend reading Weng’s post above to see his analysis of the case law and his views on this topic. In summary, the Federal Court agreed that an award of damages can be made in a section 181 action. However, the Federal Court correctly pointed out the fact that the company should never have been a petitioner in the section 181 action. The only party who has the standing to bring such a section 181 action is generally a member of the company. A company can nonetheless be added in as a nominal respondent to such an action and this is often done in order to ensure any Orders or reliefs will bind the company. But in law, there is no such thing as a nominal petitioner. This section 181 action in this case was therefore essentially akin to a derivative action, where the minority shareholders had included the company as a form of plaintiff-claimant and the company was moved to sue for damages. So while the question of law was answered in the affirmative, the award for damages to the company was set aside. I make some general points on this. I agree that the case law is in support of the position that damages can be a remedy granted under section 181, though it is rare remedy to be granted. For damages to be awarded to the petitioning shareholder, theoretically it appears to be possible but there are many hurdles barring such a relief (e.g. that any loss that a shareholder may have suffered due to the oppressive conduct is merely a reflective loss and the real loss is suffered by the company). For damages to be awarded to the company on the other hand, I have successfully argued cases to allow for the company, which would be a nominal respondent in the section 181 action, to be compensated with damages. A common situation would be where the majority shareholders or directors had utilised company funds to defend the section 181 action, both in moving the company to resist the oppression action as well as to use company funds to mount their personal defences. Company funds should not be utilised in what is essentially a shareholder dispute and in allowing the section 181 action, the Court had ordered that these fees be repaid back into the company. (ii) Who has standing to bring a section 181 action? As touched on earlier, the case of Koh Jui Hiong involved the 1st Petitioner being merely a director of the company. In the High Court, the objection was taken that the 1st Petitioner had no standing or locus standi to bring the section 181 action. This objection was dismissed as it was held that the 1st Petitioner was the alter ego of the 2nd Petitioner (another corporate entity which was a shareholder of the company) and so the 1st Petitioner was in law the 2nd Petitioner’s directing mind. With respect, this finding appears to be wrong and where prima facie the only person who has standing to bring a section 181 action is a member of the company (or a holder of a debenture of a company, a circumstance which is not relevant in this case). In interpreting the term “member”, the applicant in a section 181 action must demonstrate that his name appears on the register of members at the date of commencement of the action. Nonetheless there is an important exception that has been carved out of this general rule. The Federal Court in Owen Sim had ruled that the exception to this general rule would exist where the majority shareholders may be estopped from denying the status of the Petitioner as a member. The Petitioner in Owen Sim had a legal, beneficial and registered interest as a member of the company which the majority wrongfully forfeited and therefore removed his shareholding. The very oppressive act itself had denied the Petitioner in Owen Sim of his standing to bring the section 181 action. The High Court in Julian Suresh Candiah v AXIS IP Sdn Bhd (Kuala Lumpur High Court Originating Summons No. 26NCC-27-03/2013) (the Grounds of Judgment were downloaded from the KL High Court website with that obstrusive watermark) dealt extensively in analysing the standing of a “member” to bring a section 181 action. 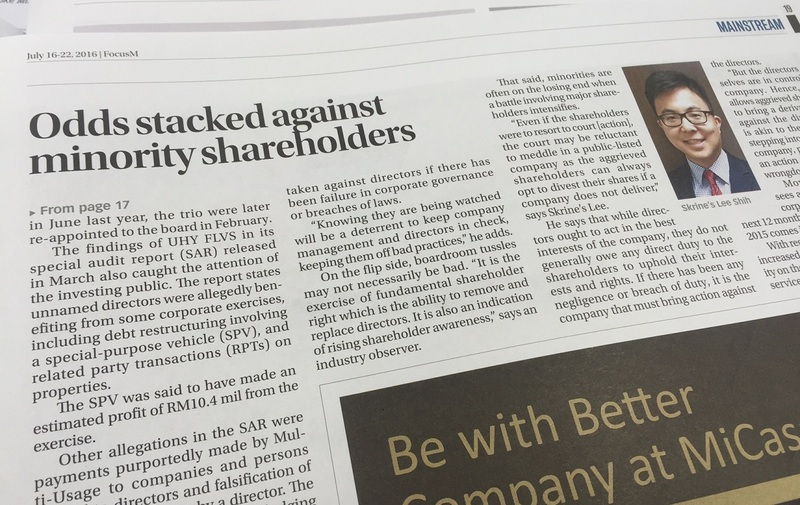 The Plaintiff in this action had signed a draft shareholders agreement (which was marked ‘subject to contract’) and it appeared that representations had been made to the Plaintiff that he would obtain shares in the company, Axis IP Sdn Bhd. It was accepted that the Plaintiff did not fall in the general rule of being a member of the company and neither did the Plaintiff fall within the Owen Sim exception. Any estoppel was not sufficient to create legal rights or interests in this case. Even if it could be said that the Plaintiff had obtained some form of beneficial shareholding in this case, which the Court held that the Plaintiff had not, the Court doubted that this armed the Plaintiff with standing for section 181. If the Plaintiff were a beneficial shareholder, the Plaintiff would still have to seek rectification or file a civil suit for the appropriate declarations first. Therefore, the High Court declined to expand the exception recognised in Owen Sim. It will be interesting to see if this case is appealed and to then read the Court of Appeal’s grounds of judgment. (iii) Section 181 action only against a Malaysian company? The case of Julian Suresh Candiah also touched on the point on whether a section 181 action could extend to a company which was not incorporated in Malaysia. One of the other Defendants in the section 181 action was AXIS Real Estate Advisory Pte Ltd, a company incorporated in Singapore. One of the Plaintiff’s contention was that he was also promised shares in the Singapore company and therefore was complaining of oppressive conduct as a ‘shareholder’ of the Singapore company. The High Court held that section 181 did not extend to companies outside of Malaysia and therefore struck out this action against the Singapore company. I agree with this interpretation so far as where the oppressive conduct is launched based on the shareholding of that non-Malaysian company. But in the situation where a foreign company may be a party to the oppressive conduct, for instance, where the directors wrongly transfer company assets to a foreign company in which the directors have interests in, a section 181 should extend to allow the foreign company to be included as a Defendant to the action. I had earlier written about the Federal Court decision of Jet-Tech Materials Sdn Bhd & Anor v Yushiro Chemical Industry Co Ltd & Ors and another appeal  2 MLJ 297 and its sweeping finding that breaches of shareholders agreement cannot form the basis for an oppression action under section 181 of the Companies Act 1965. For a more detailed commentary on Jet-Tech do click on over to Weng Tchung’s view on this decision. It is a recommended read.